LAS VEGAS – Celebrating its fourth year on the Las Vegas Strip, the “For The Love Of Cocktails” Grand Gala will bring together the nation’s leaders in spirits, mixology and cocktails on Friday, May 19 at Delano Las Vegas. The Grand Gala will kick off with a happy hour reception at 5 p.m. at Franklin where guests can mix and mingle before the main event. VIP ticketholders will have access to the gala at Skyfall Lounge at 6 p.m. followed by general admission entry at 7 p.m. The exquisite event will offer a variety of craft cocktails along with gourmet appetizers and entrées from Alain Ducasse’s Rivea and access to meet world-renowned mixologists and chefs. Top-tier entertainment and additional surprises throughout the evening also will be included. Tickets start at $99 plus tax and are available for purchase on the For Love of Cocktails website. Presented by top spirits consulting, marketing and design firm, BACK BAR USA, “For The Love Of Cocktails” spans the Las Vegas Strip in partnership with MGM Resorts International. The United States Bartenders’ Guild (USBG) will once again play a prominent role in the event through bringing in top mixologists and bartenders from across the nation. The event would not be complete without world-renowned mixologist and author Tony Abou-Ganim, whose non-profit, the Helen David Relief Fund for Bartenders Affected by Breast Cancer, receives proceeds directly from ticket sales. Back Bar USA is a full-service marketing, consulting and design firm with more than 25 years of experience in the beer, wine and spirits industries. Specializing in corporate and national account beverage programs with an emphasis on gaming, resorts, nightlife and fine dining, the company provides services ranging from menu development to ground-up venue concept, design and execution. Back Bar maintains an impressive portfolio of clients and brands. For more information, visit www.BackBarUSA.com. For The Love Of Cocktails is a three-day event celebrating the art of mixology, hosted by BACK BAR USA in partnership with world-renowned mixologist and author Tony Abou-Ganim and the United States Bartenders’ Guild (USBG). Through a series of events held in Las Vegas, attendees will come together to experience great cocktails, celebrate mixology as a craft and support an incredible charitable foundation, The Helen David Relief Fund for Bartenders Affected by Breast Cancer. Tickets will grant guests access to specialty cocktails, hand crafted by Las Vegas’ top USBG bartenders, and may be purchased at http://www.fortheloveofcocktails.com. 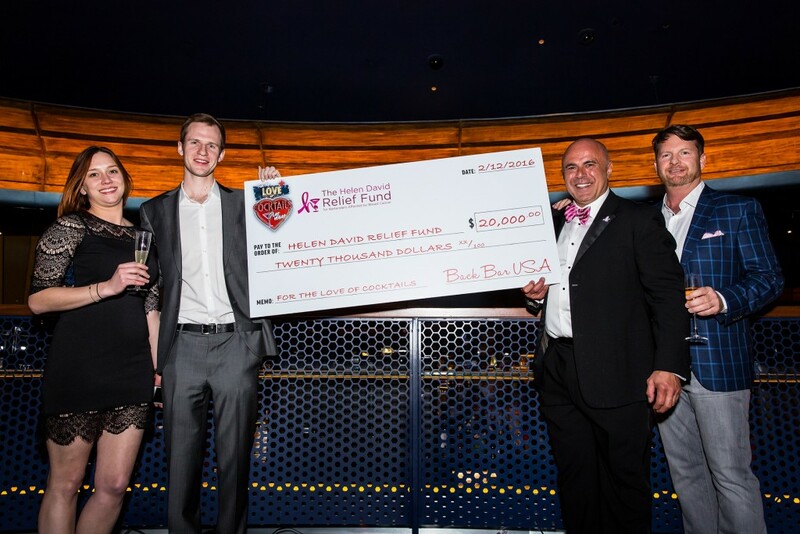 The Helen David Relief Fund, a 501(c)(3) nonprofit organization, is a program of the USBG National Charity Foundation which honors the memory of Helen David, master mixologist Tony Abou-Ganim’s aunt, beloved bar owner and community leader who lost her battle with breast cancer. In her honor, the Helen David Relief Fund assists women in the bar industry nationwide by providing pre-screening services for breast cancer. The United States Bartenders’ Guild is an association comprised of the most skilled, knowledgeable, and professional bartenders in the industry and is dedicated to uniting professionals in service to the traditions of the bar and hospitality trade. After putting down California roots in 1948, the USBG incorporated as a nonprofit (50 years strong!) and are now active in 45 markets nationwide with another dozen in the process of forming. For more information or to become a member, visit http://www.usbg.org. Tony Abou-Ganim is widely regarded as one of the pioneering and leading bar professionals in the world. He has made dozens of national TV appearances on shows including TODAY, Iron Chef America, Good Morning America, CNBC, Fox News and more. Abou-Ganim is the author of The Modern Mixologist: Contemporary Classic Cocktails (Agate, 2010), which offers readers an in-depth look into spirits and ingredients available to today’s mixologist, both professional and amateur alike. This entertaining and informative journey will take readers from the early stages of the cocktail to what Abou-Ganim has come to deem “Modern Mixology.” Abou-Ganim also has a DVD to his credit, Modern Mixology: Making Great Cocktails at Home, and hosted the Fine Living program Raising the Bar: America’s Best Bar Chefs. Abou-Ganim has also won two Iron Chef America competitions; his first pairing cocktails with Iron Chef Mario Batali in “Battle Mango,” and most recently pairing cocktails in “Battle Tequila and Tortillas” with Iron Chef Jose Garces. His signature branded line of Modern Mixologist bar tools was released in early 2013, along with his second book, Vodka Distilled (Agate, 2013). Abou-Gamin is also a partner at Inoteca Liquori in New York City. www.themodernmixologist.com. Delano Las Vegas offers a new all-suite, smoke-free luxury hotel experience located steps away from Mandalay Bay. Featuring a unique sand-meets-water design, Delano blends signature elements of Delano South Beach with the distinct energy only found on the Las Vegas Strip. The hotel offers dynamic social spaces such as Franklin, an eclectic lounge; 3940 Coffee + Tea; and Della’s Kitchen, where “historic farmhouse meets urban kitchen.” BATHHOUSE Spa infuses the soothing elements of locally sourced ingredients, drawing inspiration from Morgans Hotel Group’s collection of hotels around the world as well as Delano Las Vegas’ desert locale. Delano Las Vegas is a wholly owned subsidiary of MGM Resorts International (NYSE: MGM). For more information and reservations, visit delanolasvegas.com or call toll free at (877) 632-5400 or find us on Facebook and Twitter.